Note: For 2014, please check the price of the meat as stated below. Chinese New Year (26-27 January 2009) is just around the corner and many Chinese are already busy preparing some gifts for their family, relatives, friends and clients prior to the celebration. 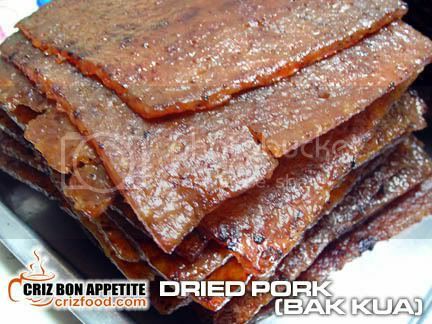 Some would buy hampers filled with canned and dry stuff whereas some would still go for the traditional way of giving away some BBQ meat (Bak Kua/Rougan), a Chinese salty-sweet dried meat product similar to jerky. 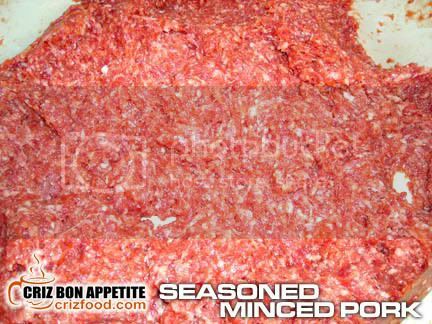 There are actually two variants, one with minced meat slices and the other with slices of meat straight from the solid meat blocks. It could either be made out of pork or chicken. 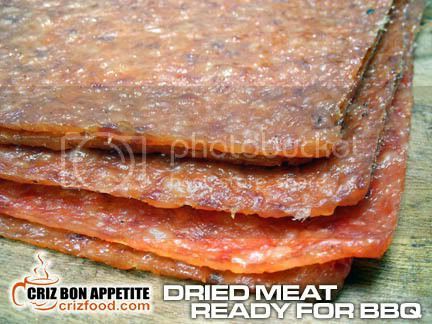 Have you ever wonder how these juicy dried meat slices were made? Let me share with you what I have learned through my recent visit to a BBQ meat maker in Georgetown who has been making this delicacy from her home for over a decade. The preparation is actually quite simple but the process of making the dried meat could be real time consuming. Pieces of choice meat (80% lean and 20% fat) would be minced and then mixed with some seasonings such as soy sauce, salt, sugar (some would use honey), 5-spice powder, pepper and rose wine. The mixture would be left to marinate for awhile before proceeding to the next process. The mixture would then be spread evenly but thinly onto customized large aluminum trays. Some makers, especially those older ones would still use bamboo trays to spread the mixture. These trays would then be placed inside a slightly heated oven to dry the meat. Traditionally, these would be left out in the sun to dry but the modern generations of people had shy away from purchasing food using this method as the food might be contaminated with dust particles and bugs. Thus, through this hygienic process, the food would be safe for consumption. After leaving those trays in the oven for some time, this would be the result. 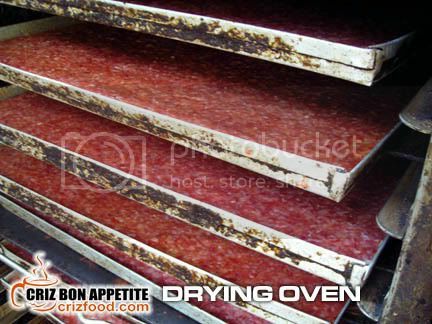 You will get huge slices of dried meat but this is not the end of the process. There would be the final preparation. These huge meat slices would then be trimmed into smaller slices and BBQ to perfection. The maker has two ways of barbequing the meat slices. She would either use a metal net over some burning charcoals or by using an electrical BBQ machine when the orders get too many. 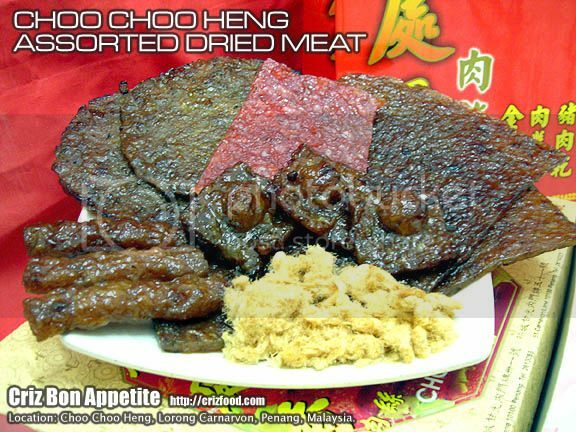 The other variant which I had mentioned earlier would be the dried chicken. The preparation would be the same except that they would use a customized mould with holes on it to make them round. 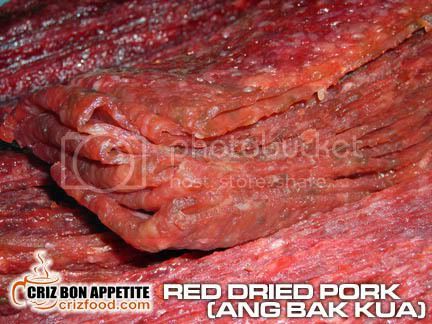 They do also produce the Red Dried Pork which is of a lesser quality and flavors compared to the ones mentioned above. These are normally used by our local hawkers to prepare Roti Bak Kua (Dried Meat Buns). Over the years, Bak Kua has evolved into something different. They are now being produced in strips form that made eating easier. 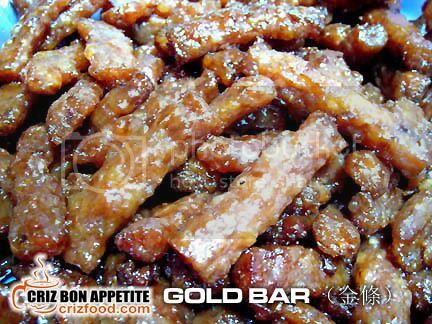 These yummy and juicy strips are called the Gold Bars (金條). Unlike the step of spreading the seasoned meat thinly, they are rolled into long bars and followed the same drying process as above. 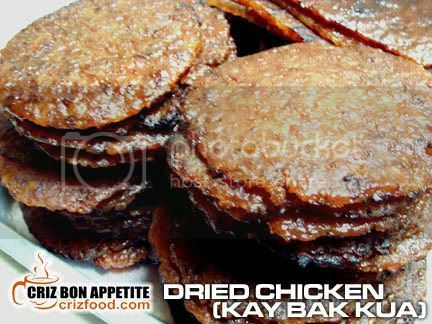 These would then be fried instead of being BBQ, leaving the inner layer to be moist with rich flavors. These have been my all time favorite. Sad to say, they only produce them once a year, just a month before the Chinese New Year. Even my friends and relatives had not stopped reminding me to order them yearly. I had tried from many sellers but theirs had been the best so far. 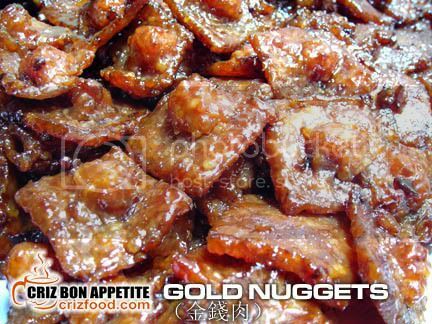 Another fried version would be the Gold Nuggets (金錢肉乾) which have thinly spread meat as the base and a small amount of minced meat on the middle. These again have been the much sought after dried meat after the Gold Bar. I could not get enough of these either. 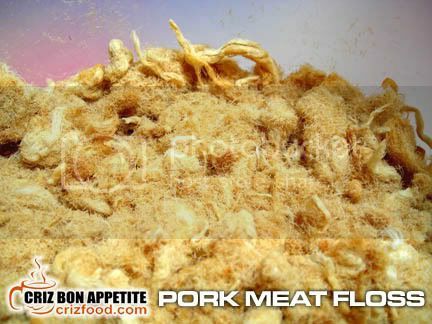 You should also not miss out their Pork Floss too. The floss was always fresh, well flavored and crunchy. I’m still trying to remember how many slices of bread, spread with butter and sandwiched with the yummy pork floss I had last evening. LOL! Since the festive season is near and stock could be quite limited, MAKE SURE YOU CALL UP to book your order prior to visiting them. They do not have a counter (remember? It’s a house) to sell you the delicious dried meat if you did not make any reservations. The house is strategically located along a small lane off Lebuh Carnarvon. 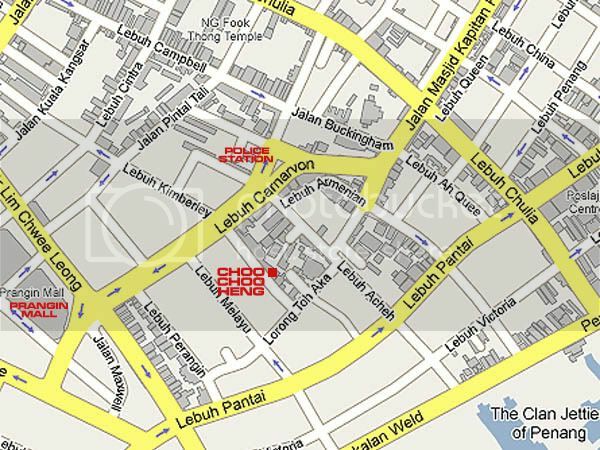 If you are coming from Jalan Dr. Lim Chwee Leong, turn left into Lebuh Carnarvon. Drive on until you see a police station (on your left), turn into the first right turning back into the other side of Lebuh Carnarvon. You will see a mamak store on your left. Drive on until you have reached the second left junction (Lorong Carnarvon). The house is on the left somewhere almost towards the end of the lane with a small red sign with gold wordings stating （處處香肉乾）Choo Choo Heng Dried Pork. Address: 51 Lorong Carnarvon, 10100 Penang, Malaysia. cny is once again the time for bak kua .. and we’ll deal with the heatiness and sore throat later!!! the gold bars look interesting. will try them this year! Wasted you were not at the gathering… I had bought samples. oh bak kua…… famous as gift during cny. i like to eat but i try to control not to eat so much. i like bak hu too. yummy.